Jalgaon district ( Maharashtra) rainfall ended at 8:30 am 29th. Heavy rains in Delhi NCR ..Ranging from 10-56 mms. Maharashtra overall available live water storage is on only 9% as of today. Mumbai overall dams storage is on 20%. 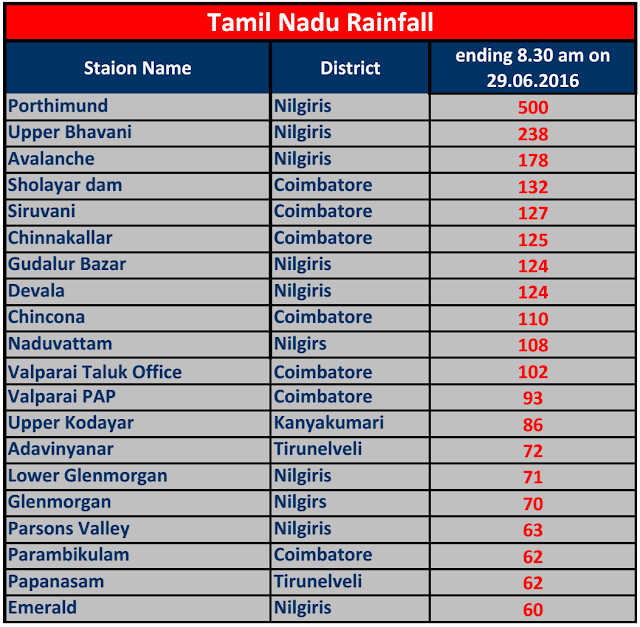 Except Vihar & Tulshi rainfall (as it is on coastal) .. Rest other dams rainfall looks like 24hrs rainfall figure !! So in short interior N.Konkan & Ghat section yet to pick up !! Rajesh sir- when will we see the heavy non stop rains in the ghat and dam areas?! The same behavior noticed also in karnataka. 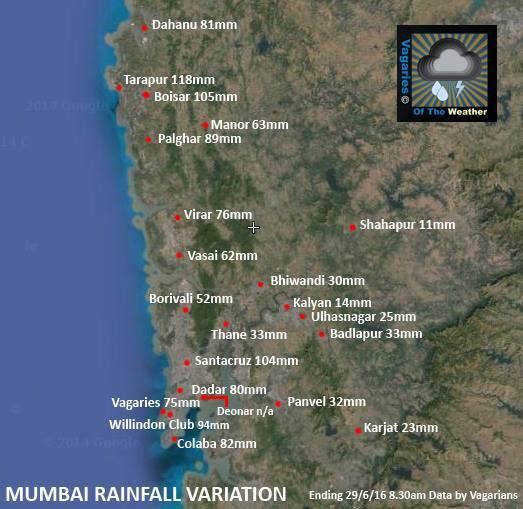 The coastal cities have got near normal and excess rainfall. But the ghat section have received only 25-30% of normal rain. That is very serious. Rajesh Sir - the low in BOB is over Telengana now?? moving westwards. If so will this give rains to the ghats and dam areas?. The BOB shows heavy cloud cover over andhra coast?. Is there any low pressure area forming?? 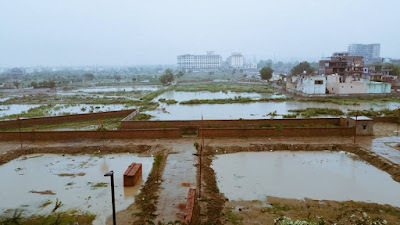 Rajesh sir,extremely heavy rains in nagothane,my town,from tuesday 3:30am without any break,the rivers are about to overflow .whats your forecast sir for my roha region and mumbai? Vijith: Currently as on Tuesday morning the Low is still off the North AP coast. Clouding extends to Telengana and adjoining regions. As expected, the rains are moving in the track. As BB-2 is expected to fizzle out, we may not expect too much improvement in the interior peninsula. 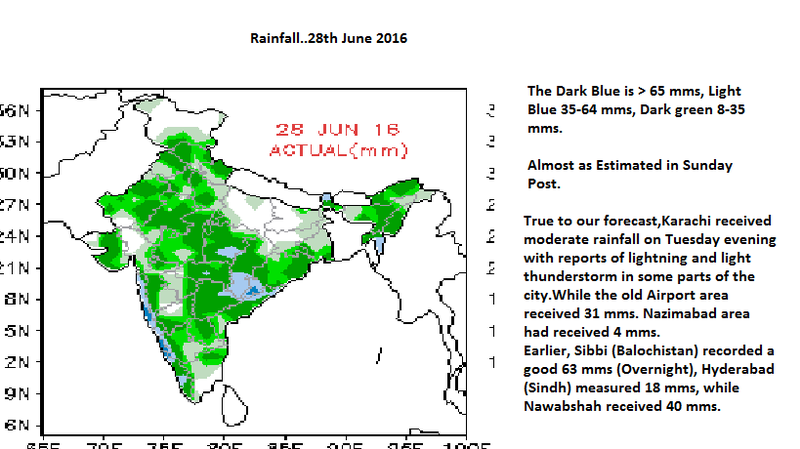 2014 june was much worse but overall monsoon was good. Superb work again sir, sir do we still have chances? Another 100+ mm day for SCZ. 682mm for the season and 1 day to go. Average of almost 65mm everyday since 20th when rains started in right earnest. SSET stop misinformation in the blog. 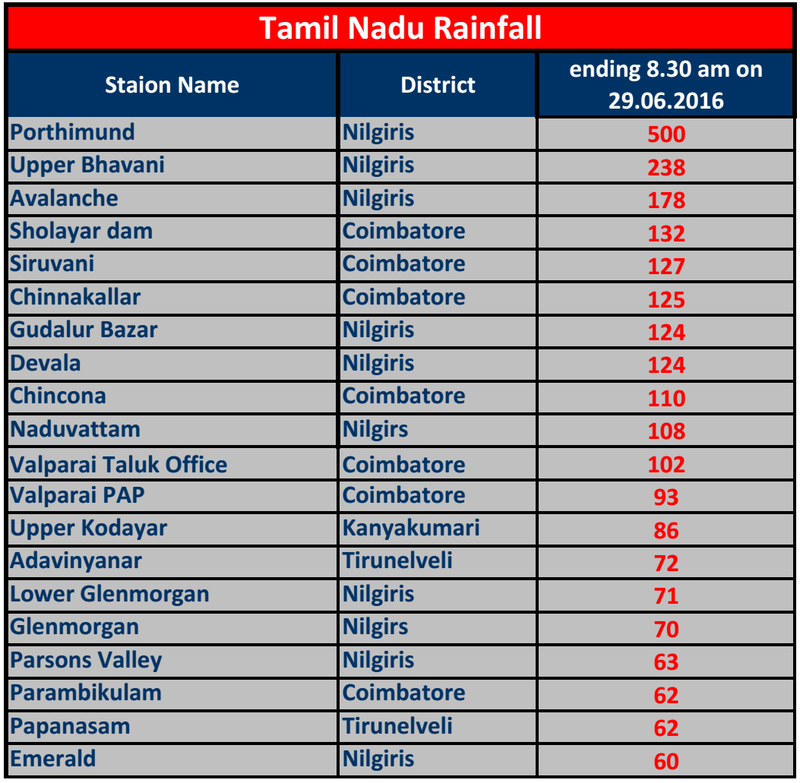 Ghat section in all western states are facing deficient rains. Avoid untrue information on the blog. 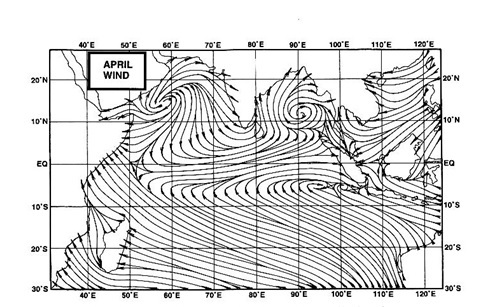 Zohair: Inflow of moist air from the System in the Arabian Sea along Sindh coast, penetrated deep into Western Pakistan. This caused thunder storms and rain in Balochistan and parts of sindh. It was this reason why Vagaries put a "yellow" shade for Balochistan in its forecast. If another weak UAC forms on the Northern tip of the Indian west coast trough (and tilted towards the West), Karachi may see light rains again on Saturday. It may take a couple of days for another UAC to form. Zohair: Karachi may see some rain , though much less, on Wednesday . BHAGAMANDALA recorded 266 mm yesterday. KARNATAKA GHAT SECTION getting good rains for the last 2 days. Please stop these kinds of deliberate message by SSET to belittle places. Harnai coastal town is just 90kms straight distance from Mahabaleshwar (an Sahyadri western ghat) is getting daily centuries, double & triple also..
And with this Harnai June total stands on 1731mm till today & Mahabaleshwar on other hand June total is just on 408mm till today😱 So this is called Vagaries of the weather !! Maharashtra Sahyadri ghats mainly from Mahabaleshwar to Igatpuri stretch are really struggling this June as not a single day century yet from stations like Mahabaleshwar, Mulshi, Lonavala,Lavasa,Khandala,Bhimashankar, Malshej ghat & Igatpuri !! This is affecting on dam levels of Mumbai,Thane, Pune & Nashik region as whole June has passed but not a single % rise in water levels !! I raised the same concern a month back, indicating that viewers come to comments section to look at local weather updates, interesting queries and suggestions. Its a pity that this person has hijacked the comments with his one point agenda , anyone else would have got the message and stopped this long back. Sorry if it offends Rajesh, but please take notice of this and request you to put an end to this . Solid rains in the Coastal Karnataka, Karnataka ghats, Coastal Konkan and even Wayanad and Idukki (highlands in Kerala). Agumbe total for June is almost back to its normal level as of today. However, interior Konkan and Maharashtra ghats are not getting as much rain as they should be by now. All the interior HRF stations like Mahabaleshwar, Gaganbawda, Sangameshwar, Matheran and Valpoi have had lesser rainfall than the coastal ones. The only reason I can think of is that the winds have not been able to push the rains properly all the way into the ghats till now. On the other hand, Cherrapunji and Mawsynram are having a disaster of a June. With only 1048 mm of rain till today, Cherrapunji is officially a scanty rainfall territory with a deficit of more than 60% till date for the monsoon period. Rajesh Sir - As per IMD another low pressure likely in 24hrs in BOB - will this low give heavy rains in ghats and Dam area?. What about Interior Karnataka as there also the dams are going dry? This seems to a case till now as all west coast are having heavy rains and interiors less rains. All Intl models predicting complete decline of El nino (Nino 3.4 is now -0.2c) and enhance rainfall activity. Your thoughts sir on July rains. Karan/vijith/ewerest: I see no major increase in the ghats section of Mah. and Karntak in the next 3/4 days. No Low is coming from the Bay in next 3/4 days. As we know, a good system from the Bay , when it moves inland towards Central India or Central Peninsula, there is a major gush of moisture laden winds from the Arabian sea towards the Ghats. This time we see the West Coast trough active. But deeper penetration inland is lacking and weak. BB-2 has produced good rains in Vidharbh and Marathwada. anant: I am not feeling offended with any comment or remark. Its just that i allow everyone to freely put his/her thoghts about the weather.i dont know sset personally, but he has been commenting on vagaries for the last 7/8 years now. Sir, Rainfall figures from Pimpri to Galan are not from Nashik district. They are from jalgaon district. Please correct it. How does the forecast for Mumbai look for the next few days till the weekend ? Rajesh Sir, I m hopeful of Maha ghats section rain may increase between 1-3 July. As Arabian system hindrance getting clear up from tomorrow so good westerlies inflow will get increase from surface to 700 hpa level & later on 500hpa also possibly.. Also it would be much much needed rainfall for dams inflow to increase which are on lowest level yet. I told to Abhijit for correction. He corrected it. 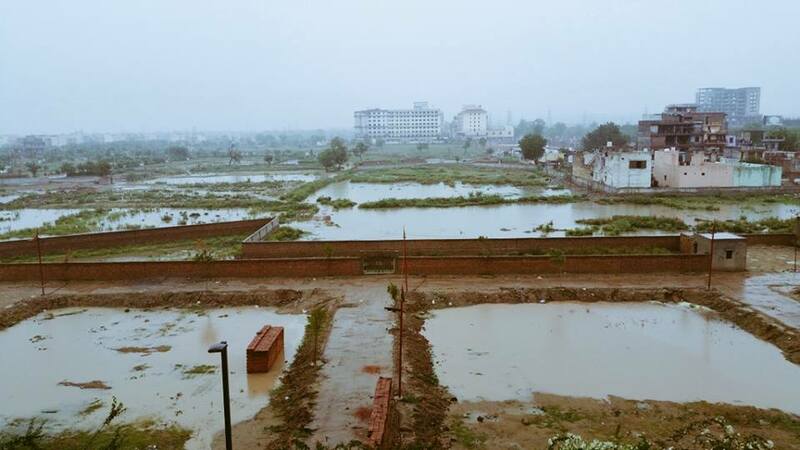 any new system for East M.P , Jabalpur`s June total rain is 95 MM Only .